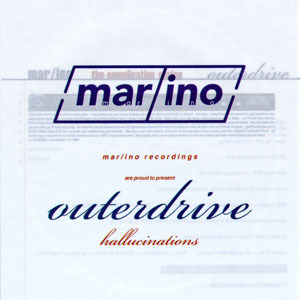 Outerdrive’s 1999 album Hallucinations is a lengthy trip into instrumental improvisation. Outerdrive are a quartet consisting of Scott Hill: Bass/Vocal. Jason Vermier: Guitar. Joshua Vermier: Drums and Geoff Walker: Fire, Air and Water? I am guessing that means Synths. Recorded entirely live and unrehearsed, basically jammed and recorded on to two tracks without overdubs or manipulations. This Detroit based band have produced a high quality of sound here. For the recording method, it was done in a garage. I like it so far and it's only the first song, I find it refreshing, even if it is over three years old, to hear bands who can play their instruments and click as Outerdrive do. It's a plus to the scene because sadly there are many bands who cannot do it as well. Those bands that knock out random shite and think its great are becoming more apparent with time. It is good to review a band that meets the criteria for Aural Innovations. We cry out for this type of stuff. Outerdrive are very spacey, very talented and they produce self-indulgent improvisation to a high quality. I hear a lot of Ozric Tentacles style jams here. Outerdrive could be likened in style to the early live cassette release Tantric Obstacles. The Ozrics do similar stuff on here; the Glastonbury and Reading Festival jams are the best audio similarity I can give, but Outerdrive never get to the chaos that the Ozrics reach, rather choosing the laid back bass induced jams. Hallucinations for me is an interesting listen. It never really changes that much in tempo, rather settling into slower Amom Düül II style rhythms. Its definitely drug music. Acid would help in the live environment. I would like the chance to catch them live. To me the best track of this eight-track album has to be the 10.29 Pink Floyd/Ozrics styled ‘Mexicali Floaties’. This track weaves through mellow synth madness, the feed-backed guitars enhancing the experience. The guitar sound is very much the same as Edger Froesse’s sound on Tangerine Dream’s early 70’s previously unreleased Green Desert album. If you like spacey floating improvisation in the style of Ozric Tentacles/Amon Düül II/Pink Floyd and many more, take a chance on this album, and remember its totally improvised and recorded on the spot. A bit like Quarkspace’s Spacefolds series and Psuedo Buddha stuff. The only thing is Outerdrive do it a hell of a lot better. Coincidentally the contact address is in Seaton Carew, Hartlepool, a place not that far away from where I live in the slums of Sunderland, the place that I sit and write this review. Strange to find that out. I would love to hear some other stuff by Outerdrive because there are not many review disks that I would actually play again after I’ve reviewed them. This one I definitely will, good stuff. For more information you can visit the Elsie & Jack web site at: http://www.elsieandjack.com.